This week at I Heart Faces the theme is - WONDER. For my adult entry: I love this picture because I don't think I will EVER get over the wonder of a baby! For my kid entry: Oh, the wonder of a baby and a beach! You can enter your photos at I Heart Faces. Have fun. I just LOVE adoptive families (probably because we're one too!!) Your pictures are fantastic. 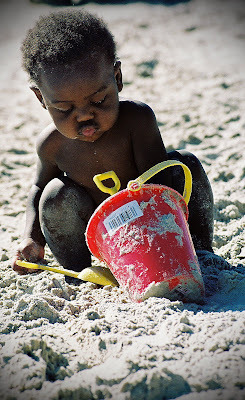 I just love a baby at the beach, sand EVERYWHERE!! So fun! Gorgeous photos!! I love the look on your face with that precious baby! What a gorgeous family. I especially love the adult entry. There is nothing more wondrous than a new baby, but your photo captures that feeling exceptionally well. Good job! Oh my gosh! I love Mommy looking at the baby! Perfect wonder filled moment! I think the beach picture is great too! Beaches are such great places for many wonder filled moments! What a beautiful shot of mom and baby! Oh my. These are amazing. Love that little ones lips all puckered up. What sweet photos! I agree with the fact that there is nothing more wonder filled than that of a new little baby! The top one is perfect! Love both the pictures! Your family is beautiful. Those are both beatiful! Love the little guy at the beach! Love the adult entry but the kid entry is one of my favorites! He is so darn cute! He has beautiful lips and I just want to squeeze his cheeks! Amazing photos!! I love them both!